Teri Rueb opens the exhibition Re-Drawing Boundaries. The Re-Drawing Boundaries online exhibition is a first of a series that will focus on thematic conceptual and aesthetic frameworks focusing on artists that have been seminal in their chosen fields. The exhibition is curated by Jeremy Hight, with Senior Curators Lanfranco Aceti and Christiane Paul. 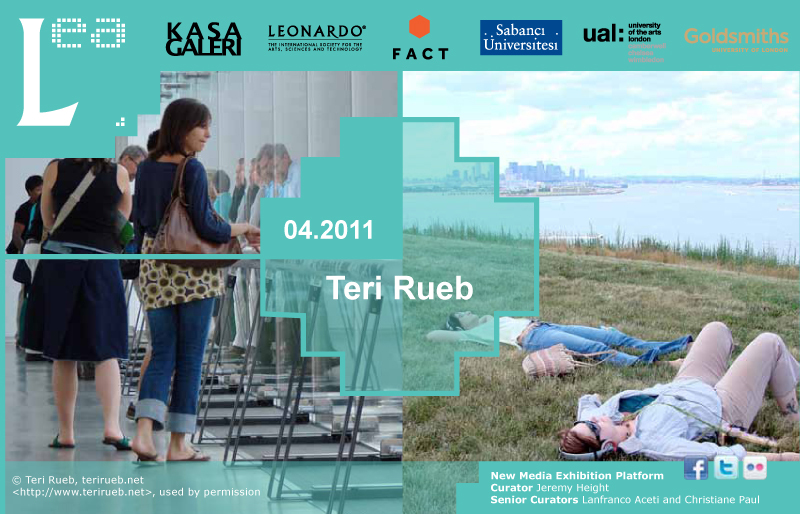 Teri Rueb is an artist whose work engages digital, architectural and traditional media and modes of production. Her most recent project, Elsewhere: Anderswo is currently on exhibit across two sites in Northern Germany, The Edith Russ Site for Media Art (Oldenburg) and the Springhornhof Kunstverein (Neuenkirchen). Another recent project Core Sample, received a 2008 Prix Ars Electronica Award of Distinction in the Digital Musics category. Rueb has pioneered the form of GPS-based interactive installations and is the recipient of numerous grants and commissions from international institutions including the Edith Russ Site for New Media, The Banff Center for the Arts, the Boston ICA, Artslink, Turbulence.org, and various State Arts Councils. She has lectured and presented her work worldwide at venues including Ars Electronica, ISEA, SIGGRAPH, Transmediale, The New Museum of Contemporary Art, Kiasma Museum, and IRCAM. Core Sample, Teri Rueb. Core Sample is a GPS-based interactive sound walk and corresponding sound sculpture that evokes the material and cultural histories contained in and suggested by the landscape of Spectacle Island. The piece engages the extended landscape of Boston Harbor as bound by the new Boston Institute of Contemporary Art building on the downtown waterfront, and Spectacle Island, a former dump and reclaimed landfill park visible just off the coast. The two sites function dialogically, questioning what is seen versus what is not seen, what is preserved and recorded versus what is suppressed and denied. Visitors take the 15 minute journey to Spectacle Island via the Harbor Islands Express Ferry from Long Wharf and borrow headsets free of charge at the Spectacle Island Visitor Center. Sounds play back automatically in response to each visitor’s unique itinerary. Thematic sound content shifts with the changing elevation contours of the path system suggesting the vertical layers of a metaphoric core sample (see map of installation). Abstract sounds and spoken word blur surface and core, natural and artificial, industrial and organic, past, present and future. The ubiquity of GPS (global positioning satellite) and other tracking technologies suggests that “being lost” may itself be an experience that is being lost. However, simply knowing one’s geographical location as expressed in longitude and latitude coordinates has little bearing on one’s personal sense of place or direction. “Drift” (http://www.terirueb.net/drift/index.html) poses the age-old question “Where am I and where am I going?” in a contemporary moment in which spatial positioning and tracking technologies provide evermore precise, yet limited, answers to this question. The installation embraces the flow of wandering, the pleasure of disorientation, and the playful unpredictability of drifting as it relates to movement and translation. Sounds blend footsteps on different surfaces with spoken word in different languages. Spoken word passages are drawn from poetry and literature dealing with the theme of wandering, being lost, and drifting. Meaning also drifts as Rousseau, Joyce, Kerouac, Mann, Dante, Woolf, and others are presented in the original and in translation. The Watten Sea becomes a metaphor for hertzian space as visitors are invited to wander among layered currents of sand, sea and interactive sounds that drift with the tides, and with the shifting of satellites as rise and set, introducing another kind of drift. LEA Interview with Teri Rueb by Jeremy Hight.